The top window displays skilfully blur the line between fashion advertising and accessible art. “Window dressing is, at first glance, so gorgeously useless that it resists all comparison with other derided professions. At least flight attendants bring you peanuts.” So said Simon Doonan, creative director of New York fashion institution, Barneys, in an outburst of self-deprecation. Doonan, after all, is renowned for masterminding some of the most talked-about window displays in the world. But his tongue-in-cheek remark glosses over the broader significance of window dressing. Windows remain the oldest means of fashion advertising. A display must grab the attention of a passer-by, creating an urge to rush in and shop. But these tableaux vivants are not just about arranging a few random mannequins and draping them with the latest merchandise. 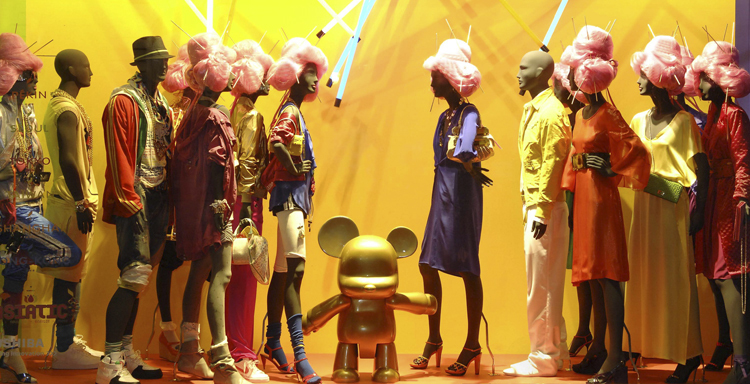 Window displays are responsible for generating an entire visual identity for the store. As a result, creative concepts rule and window dressers tend to hail from art and design backgrounds rather than marketing classes. Both Andy Warhol and Jasper Johns were former window dressers. Hélène Lafourcade is the visual identity and merchandise director for Galeries Lafayette, the iconic department store in Paris. Renowned for its high fashion, accessories and furniture, the store has been responsible for millions of deliciously guilty purchases since it opened in 1895. Lafourcade has overseen Galeries Lafayette’s extravagant window displays since 2002 and has designed 3-D billboards for 20 years. She originally studied architecture and fashion design, a combination that seemed bizarre to people at the time. “I had a feeling that the two were compatible and complementary,” she explains. At the time of Crème de la Crème’s visit, Lafourcade’s magic wand has turned the entire store into “Asiatic”, an imaginary Asian city of the 22nd Century. The concept is integrated right across the board from windows to clothes racks and the shoe department. For three weeks, Paris has its very own pocket of colourful Oriental futurism. Back in Paris, a team of 26 people in the Visual Identity and Merchandising Headquarters immersed themselves in Asian culture for six months until the day the windows of the 70,000 square-metre store were finally unveiled. The results were amazing and totally insane. Female mannequins were set in crazy fictional worlds loosely inspired by Japanese Geishas with towering pink fairy-floss wigs that have huge knitting needles sticking out of them. They were clearly a very personal and sassy interpretation of the traditions of the Land of the Rising Sun. “Humour has always been a big, big part of our designs,” Lafourcade admits. In one of the settings, a group of dummies sit upright on the conveyor belt of a sushi bar on which salmon rolls have been replaced by silk scarves and designer belts. The neon light tubes make their exuberant outfits even more lurid while the geishas wear animal-nose masks on their faces. “A ‘Hello Kitty’ vibe, sort of,” says Lafourcade with a gallic shrug as though all this makes absolute sense.